Why We need to be positive ! Imagine all the times you were complaining about somebody or something - chances are those negative feelings were leaving their mark on you in the form of stress.A lot of times, an occasional complaint may seem like an instant stress reliever. But what about such an attitude in the long run? Getting into the habit of constant grousing, particularly over trivialities or things not directly in our control (like other people's attitude, for instance), is a sure fire way to invite the negative power of stress into our being. Since stress feeds on negativity, reducing stress is a good reason to eliminate negativity and stay positive in life. There will not be too many who say they enjoy being in a state of worry. While worry itself has adverse affects on us, like yes, more stress again, the feeling of worry is not something most of us relish. 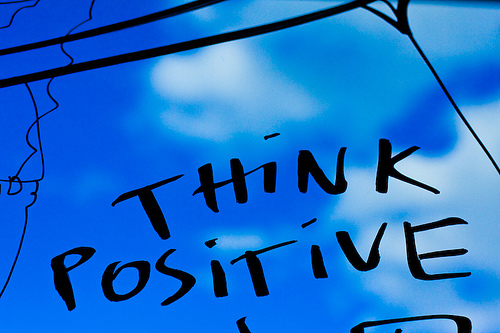 Thinking positively, and using positive words and phrases in our internal dialogue with ourselves and others, is known to actually reduce these feelings of worry. And along with it, the feelings of frustration, disappointment or other negative emotions that may accompany it, are also reduced, if not eliminated to a great extent. Of course there will be times - like health, financial or personal security situations - when it is quite natural to experience worry. It is important to realize that the power of positive thinking is not a universal prescription to eliminate all kinds of worries from our life. But, here is where a positive mental attitude scores:It frees up our creative mind to enable us to possibly come up with a solution to our problem - where none seemed in sight before - or at least get us to compromise with the situation, a bit quicker than otherwise, from the state of worry. Of course, we all experience situations in our lives which - for the lack of better word - "warrant" worry. And for those situations, time itself will have to provide solutions, or the necessary healing. But, most of situations we do experience can do without the nagging worry tagging alongside; and the power of positive thinking helps you get there quicker. This is the last, but certainly not the least important of the benefits of a positive attitude. Less fear translates to more self confidence, and a positive self esteem. This reason alone is worth the "price of admission" into the the "daily positive thoughts" mindset.Imagine what a more self confident you can do! And imagine what a positive self esteem can do to you!.Fear gnaws at our self esteem, and erodes our self confidence like nothing else; and worse, sometimes these fears escalate into anxiety attacks as well. Positive phrases, thoughts and mindset help you face your fears - slowly, its not an overnight fix, but surely - and do the things you fear, and that helps in improving self confidence.With the improved power of confidence, you can repeat your performance a little better next time, and that reduces your fear even further - confidence builds on itself - until the fear is completely gone; but remember, it all begins with a positive thought. Of course keep in mind that, while it helps, the power of positive thinking alone may not be the only sufficient "medication" for dealing with certain kinds of medically recognized fears, or more accurately phobias. A consultation with a professional may become necessary to handle the specific situation in those circumstances. Now that we got the 'Why' out of the way, it is time to move on to the 'How' - How to avail these benefits of a positive attitude? How exactly, can we call upon this power of positive thinking to serve our needs the best? It is easier than you might think.